eMed Decor & More celebrates medical professionals every day with a variety of decor, accessories, gifts and collectibles available for doctors, nurses, dentist, veterinarians, pharmacists & more. They have the perfect gift for every occasion. Take advantage of free shipping on all orders within the continental US by shopping below. 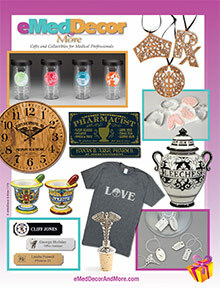 Enter the Coupon Code - Catalogs - in the Coupon Code box at checkout on the eMedDecor & More.com website.